On Saturday, September 5, 2015, around 11am, a 14-year-old girl from Ellington CT got sucked into a large and dangerous "Strainer" (Log Jam) on the Esopus Creek in the Town of Shandaken. She has been identified as Jordyn Engler, 14, of Ellington Connecticut. She was tubing the Esopus Creek with her father. The exact location was by the Allaben Cemetery off state Route 28. At the time, the DEP was releasing water from the Schoharie reservoir into the Esopus Creek via an underground tunnel. When the water is released, it will add 21 million gallons of water per hour. This causes the water level goes up drastically. Generally, tubers and kayakers prefer the water level this high, and flock to the Esopus creek when the water is released. Emergency crews spent several hours trying to extract her. Finally, they had to ask the DEP to turn off the water so that they could recover her. When rescue members arrived, they had to rescue her father from the same log jam. Swift water rescue was able to locate her body under the log jam, but they were not able to pull it out. They attempted to recover her body for three hours. At that point, the DEP made the decision to shut off the water flow from Schoharie Reservoir. This took an additional 6 hours to shut off, and for the water flow to slow down. At that point they were able to remove her. Dive teams from the police and local fire departments. I recall this sad incident last summer when I was in Phoenicia the following day. 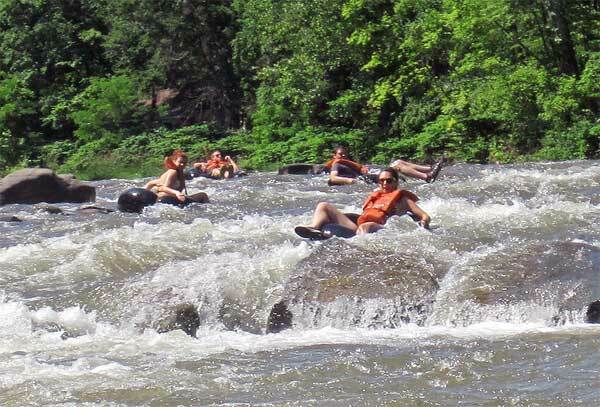 My friends and I have made it an annual ritual to tube the Esopus every summer for the past few years. It's a nice way to cool off after a weekend of hiking. I thought it was odd that F-S Tubing was closed for the day on such a popular money making weekend. We have been patronizing F-S for years and were reluctant to go to Tinker Town Tubing. I heard through one of the Tinker Town workers about this incident and the extent of the search. From my understanding, the father and daughter were not tubing the river through either of Phoenicia's tubing services. About 5 or 6 years ago, both tubing companies use to drop you off further up Route 28 at the Allaben Cemetery, but after storms and the hurricanes much of the Esopus river became too dangerous to tube. They decided to shorten the tubing trip, and now drop you off closer to town to avoid dangerous encounters with strainers and log jams.